Wrestling in the Daylight is an insightful conversation on Zionism initiated by Rabbi Brant Rosen, a prominent Jewish activist from Chicago, on his social-justice blog Shalom Rav. After Israel's brutal military attack on Gaza in 2008-2009, Rosen began to question his lifelong Zionist beliefs. 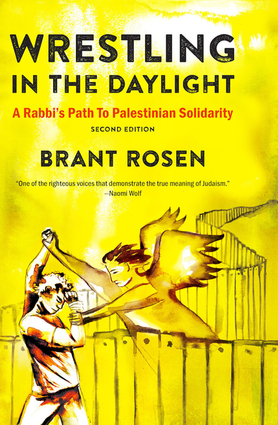 Unlike the biblical Jacob, who wrestled with his conscience in the dark of night, Rosen chose to "wrestle in the daylight" with this issue through many thoughtful essays on his blog. In this selection of content from Shalom Rav, Rosen includes both his own posts and those of his online commenters, granting readers unique insight into the largest controversy facing the American Jewish community today. In the new introduction he has written for this second edition, Rosen updates the story of the "wrestling" that both he and the American Jewish community have undertaken in recent years. "If you want to understand the inner struggle of American Jews about Israel, this is a must read." —Rabbi Michael Lerner, editor, Tikkun magazine. Brant Rosen is a rabbi, blogger, and social activist based in Chicago, Illinois, where he currently serves as the Midwest Regional Director for the American Friends Service Committee. In 2014, Rosen co-founded a social-justice focused Jewish congregation called Tzedek Chicago after many years serving as a congregational rabbi in Evanston, IL.